Well, not from scratch. I bought a kit to build an ErgoDox keyboard on Mass Drop which made things considerably easier. The kit brings all the necessary parts and it's really easy to ensemble. There is a more comprehensive build guide in their site, but I wanted to share my experience building it. I built mine with the help of a friend who also bought a kit. First you start with the stabilizers. They are small plastic pieces you use for the bigger keys, there are 4 of them. This is, by far, the hardest part of the assembly. We found that the pieces were too big and had friction problems, we ended having to remove some plastic material with sandpaper. Once we got the stabilizers working as desired, we put all the switches in, getting ready to solder them to the PCB. I bought Cherry MX Clear switches, I love the tactile feedback and the quiet noise. My friend chose the loud Green switches instead. And then solder all of them! Having all the switches soldered to the PCB we tested the boards and they worked fine, all keys were responding. The next step was to ensemble the case. It's a layered construct, and very simple to build. The next step as surprisingly hard. Putting the keycaps in the keys. 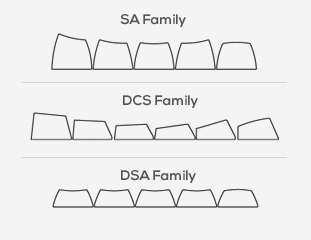 I know it sounds simple, but we bought DCS keycaps, which mean they are sculpted and each keycap can only go in one row. We spent some time trying to classify the keycaps, and some more time trying to figure out where each one went. We used every image we found in the manufacturer site for reference and after a few tries we finally put them in the right places. And then the last step. Add some rubber legs to each hand so it doesn't slide on the table. And how it looks in my desktop. With keyboard completed and working the next step is to configure the layout, because this keyboard is a programmable one. They have at their site a configurator that will allow you to define a layout with as many layers as you want and download it with the latest firmware ready to flash your device. I'm still tweaking mine. I'm trying to make it good for programming while keeping it as close as possible as the one my Truly Ergonomic keyboard has, because I love it and I'm used to it. The Truly Ergonomic was a great keyboard, but they have switched from Cherry MX switches to Kailh compatible switches. I know friends that bought it and had tons of problems with those switches, so I no longer recommend that keyboard. Fortunately mine has genuine Cherry MX Brown switches and works like a charm. You can find the JSON configuration file here in case you want to use it for your keyboard or as a starting point to create your own layout.